Brandon Turbeville is an author out of Florence, South Carolina. Turbeville has published over 190 articles dealing on a wide variety of subjects including health, economics, government corruption, and civil liberties. Brandon Turbeville's podcast Truth on The Tracks can be found every Monday night 9 pm EST at UCYTV. The AAP position was made clear when the organization endorsed the World Health Organization (WHO) report issued as a result of the June 2012 GAVCS meeting. 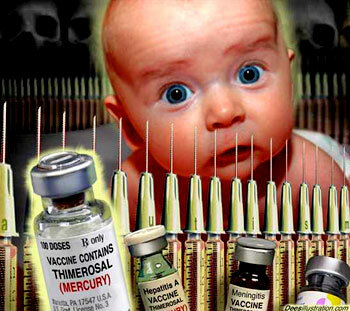 The conclusion, of course, was that thimerosal does not cause neuro-developmental disorders and that the mercury-laden preservative is completely safe for use in vaccines. Based on the current evidence, GACVS considers that no additional studies of the safety of thiomersal in vaccines are warranted and that available evidence strongly supports the safety of the use of thiomersal as a preservative for inactivated vaccines. GACVS believes that consideration of additional evidence suggestive of the contrary should be based on studies using the same high standards of epidemiological and causal inference needed for scientific research. Thiomersal allows millions of people worldwide to have access to life-saving vaccines and to date, no other safer and equally efficacious alternative has been identified for many vaccines. As I have written on at least two occasions, the fact that mercury, especially the type used in vaccines, is hazardous to human health is established fact. Even the Environmental Protection Agency (EPA) recognizes this and has set the toxicity limit of mercury at .1mcg. However, the annual flu shot contains as much as 25 mcg by virtue of the Thimerosal preservative. This is 250 times higher than the limit of toxicity set by the EPA. Clearly, the dangers of mercury exposure are legion, particularly when applied to young children. The adverse health effects related to mercury exposure are established fact. That mercury is detrimental to brain function is not up for debate. Even studies published in medical journals such as Pediatrics demonstrate the clear danger of mercury exposure and the harmful effects on the brain. The developing fetus and young children are thought to be disproportionately affected by mercury exposure, because many aspects of development, particularly brain maturation, can be disturbed by the presence of mercury. Minimizing mercury exposure is, therefore, essential to optimal child health.